Placemaking with Public Art: Who decides? 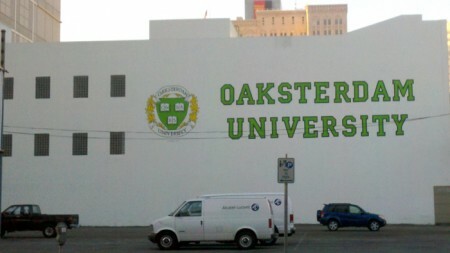 VSmoothe over at A Better Oakland has a recap of a recent Oakland Planning Commission Meeting in which the above Oaksterdam University signage was judged to violate Oakland business signage size ordinances. 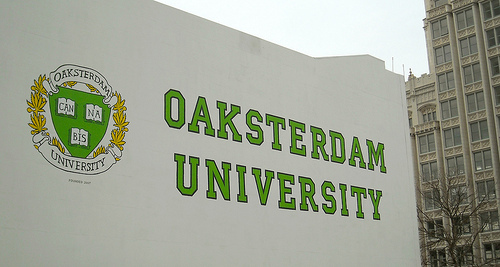 As she notes, since “the Planning Commission was clearly sympathetic to Oaksterdam University” discussion turned to redoing the sign as a “mural” or “special sign” in order to skirt the legal issues. As this discussion has been going on for a year, Oaksterdam had already put out an open call to attract artists to redesign the sign as a mural. This is when the Planning Commission decided it was their place to choose which of these public art proposals should go forward. If we’re talking about a mural with a purpose for place-making, that mural should be judged not only for relevance to the area and the people there, but also specifically for it’s innovation and interpretation of those concepts. This proposal does not address the specific locality as a place, other than being located in Oakland. A mural will not assist in place-making if 1. it does not address the specific place and 2. is aesthetically bland. Artworks and architecture can have a drastic effect on the community and pride of an area, especially if it is something that stands out. The TransAmerica Pyramid was deplored when it was built. But what would the San Francisco skyline be without it? Bold moves are sometimes required. Risk is rewarded with awareness, even if some people hate it. Richard Serra’s Titled Arc was eventually removed, but now many people think of Federal Plaza as the place where it existed. Since we’re all into voting these days, which do you like the best? Perhaps an art audience has a slightly different opinion than the Planning Commission? Which proposal for the Oaksterdam Mural do you like best? hey freddy, that’s a good point. I’d personally prefer it if the sign didn’t have the “university” part at all. So it would be more like a neighborhood sign and less like a billboard. How about a option for NONE? 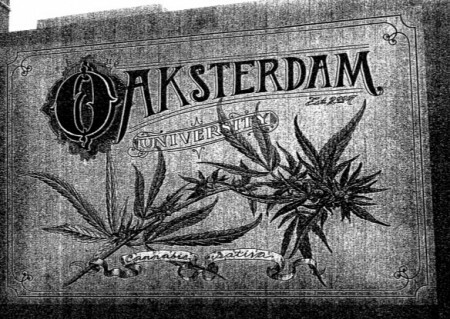 Oaksterdam University is non-accredited and FOR-PROFIT. It offers no scholarships or financial assistance. This is advertising – not public art. Why is it allowed to shove its huge honking billboard right in our face at street level? What is the city receiving in return? What message is sent to the high school students in charter schools downtown and those transferring on city busses? What does this say to potential tenants for the offices vacated by APL and Clorox? Would we be happy to skirt the legal issues if this wall were screaming “Wells Fargo” or “Drink Coke”?